With its XT600 of 1976, Yamaha became the unchallenged world leader in big single cylinder off-road four-strokes. In 1982 came the first development, the XT550, fitted with a four-valve cylinder head and a balancing shaft. It was in turn replaced by the XT600 of 1984, which was an enormous success. Yamaha re-examined the specification and in late 1989 launched lhe ultimate version, the XT600E, which became the best-selling motorcycle in France in 1990. This new XT was precisely tuned to the needs of the market. The fulfillment of a daydream, it borrowed the lines of motocross models with their characteristic two large airscoops on the sides of the fuel tank to divert the air over the engine. More civilized, the XT had an electric starter and its saddle was lowered to make it easier to ride in town. Economical in use, it abandoned the bellcrank rear suspension, and had some neat touches like the silencer, which replaced a rear frame brace. It still had technical refinements like the siamesed carburetors which gave excellent flexibility. 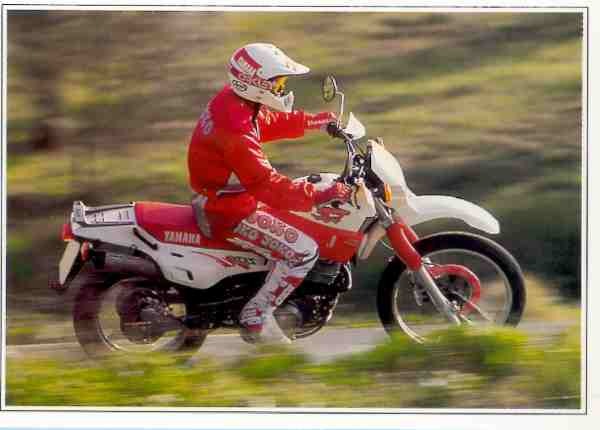 More of a highway bike, the XT600 never claimed to be a real enduro machine, but it was still very much at home on the trails and its price represented excellent value. Also listed was the XT 600 K, which had no starter. One of the best of the multi-purposes bikes, the XT 6001 is equally at home on road or track.